Leaders concerned with Americaâ€™s growing skills gap met last week in Washington to focus on solutions to this national problem. A panel featuring higher education, government, and manufacturing experts described their various initiatives aimed at closing this gap.Â Jay Timmons, President and CEO of the National Association of Manufacturers (NAM) described current progress as slow, but he also stated that the nation is set to make great strides in the long-term. Â From a higher education perspective, Bob Templin, President of Northern Virginia Community College, agreed that a larger number of high school graduates are not ready for postsecondary training. However, he also noted that secondary and postsecondary schools and business and industry are actively teaming together to create solutions. View the entire event and additional resourcesÂ here. Students with both an associate degree and a certificate in information technology (IT) had the strongest employment outcomes in terms of likelihood of employment, hours worked, and earnings, according to a recent Community College Research Center (CCRC) issue brief that examined Washington state students. The Employment Outcomes of Community College Information Technology Students explored the role of community colleges in educating IT workers and examined two key issues: Â studentsâ€™ employment outcomes by the type of community college IT preparation they complete, and the type of employers that tend to hire community college IT students. CCRC assessed data on students who were enrolled in an IT program at any Washington State community and technical college during the 2000-01 academic year and who completed their program or left college by the spring of the 2004-05 academic year. 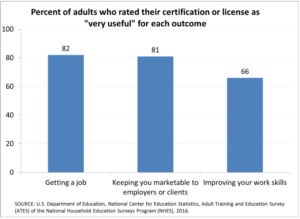 The students who followed in likelihood of employment, hours worked, and earnings were those with an IT associate degree, and then followed by students with an IT certificate. Students who earned no credential but focused their studies in IT had the weakest employment outcomes, according to the brief. New data provided by the Institute of Education Sciences highlights the proportions of CTE concentrators who enrolled in postsecondary institutions, how long it took them to enroll, and the types of degrees or certificates they earned between 1992 and 2000. What percentage of CTE concentrators enrolled in college? How soon after high school graduation did they enroll, and what types of postsecondary institutions did they enter? â€¢By 2000, the majority of CTE concentrators from the class of 1992 had enrolled in postsecondary education (65 percent of the total group of CTE concentrators, 59 percent of the CTE only subgroup, and 82 percent of the dual CTE and college preparatory subgroup). â€¢More than half (56 percent) of all CTE concentrators began their postsecondary education at a community college, while 37 percent began at a 4-year institution, and 7 percent at another type of institution. What proportion of CTE concentrators who enrolled in a postsecondary institution earned a postsecondary certificate or degree? â€¢Among the total group of CTE concentrators from the class of 1992 who enrolled in a postsecondary institution, about half earned a postsecondary certificate or degree by 2000, while about one-quarter (26 percent) earned a bachelor’s or higher degree. â€¢A higher proportion of college preparatory only students earned a postsecondary certificate or degree than both the total group of CTE concentrators and the subgroup of dual CTE and college preparatory concentrators. â€¢Comparing the total group of CTE concentrators with general education students, there was no detectable difference in the proportion who earned a postsecondary certificate or degree, but CTE concentrators were more likely to have earned an associate’s degree as their highest degree, and less likely to have earned a bachelor’s or advanced degree by 2000.
â€¢About 6 percent of the total group of CTE concentrators had not earned a postsecondary certificate or degree by 2000 but were still enrolled in postsecondary education, while 43 percent had not earned a postsecondary credential and were not enrolled. Visit the IES Web site for more information.